Shawn McNeil, (above) a resident of Press Park, remembers when the floods or Hurricane Katrina spilled over the levees in New Orleans Lower Ninth Ward and into the yards and houses, washing away the dreams of residents who barely escaped with their lives. Her neighborhood, Press Park, was later found to be toxic. She and her family lived in a house, but down the street was the city townhouse project for lower income dwellers that had been built on toxic waste ground, unbeknownst to anyone, and a lot of people died from it. She knew something was amiss when one of her sisters died of cancer and another came down with the disease but beat it. On a recent tour of the area, it was evident that people literally escaped with the shirts on their backs. Throughout the townhouses, clothes were left hanging in closets, plates were left on tables, keepsakes were strewn around without prejudice. Each house was evidence of broken dreams. Shawn herself has never fully recovered from the trauma. 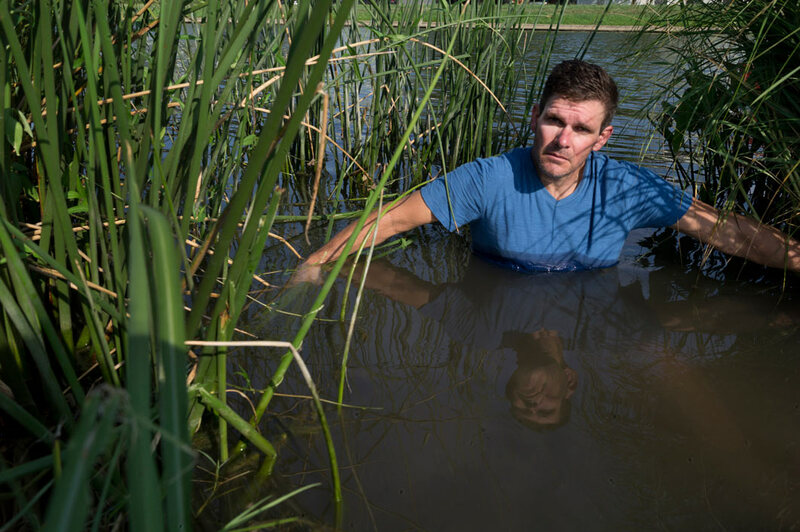 Ken Bellau, a longtime New Orleans resident, wades in St. John’s Bayou in the middle of New Orleans, LA., just weeks before the 10th anniversary of Hurricane Katrina’s catastrophic swipe over the city. Bellau is one of the heroes of the floods. As the water rose, he used his kayak to get to a motorboat that didn’t belong to him. He knew the owner and where the keys were stored. With the boat, he saved over 400 residents and their animals. He assisted the National Guard for weeks in steering through the unchartered waters and neighborhoods that he knew like the back of his hand, having grown up in the Big Easy. 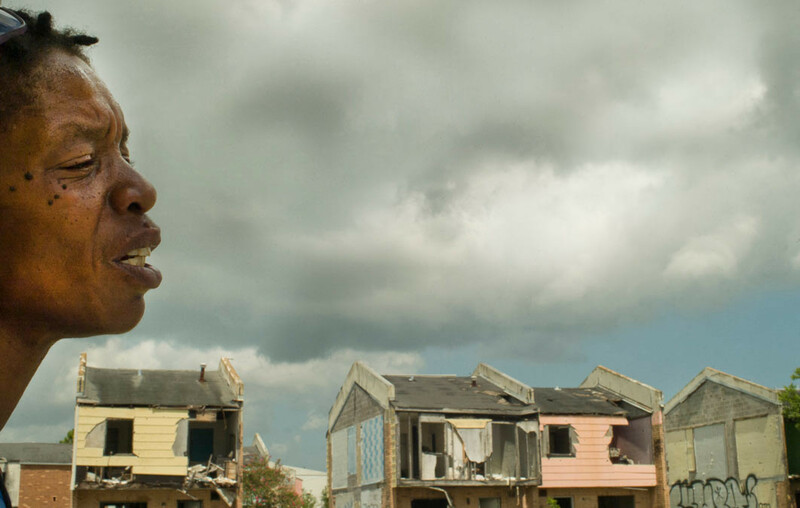 Ten years ago, Hurricane Katrina swept over New Orleans and almost killed the city. Levees, guaranteed to protect the residents from riding waters, burst wide open and the floods that followed covered houses up to rooftops, washing away history and culture and the dreams of many residents. People died, animals died, and New Orleans was crippled, it’s Lower Ninth Ward residents forced to seek shelter in the city’s sports stadium where life became unbearable as President Bush flew over in a plane to inspect the damage, his feet never touching the ground to comfort his fellow Americans. The floods covered much of the city but the Lower Ninth Ward, one of the city’s poorest areas, suffered the most damage. Ten years later, some things are much better. Where houses had been washed away and off their foundations, there are new homes, modern homes designed by young architects with great design ideas. But there are still many more houses that stand abandoned and their guts spilled. Somehow, despite almost insurmountable problems, corruption, failure by the government to live up to promises, even well-meaning people coming in to rebuild, but not for the people who were washed away, New Orleans has survived. Ten years has not erased the vast empty areas where no one has to come to rebuild or help people in those areas but in New Orleans, there are heroes who rebuilt, who refused to be pushed out, who refused to die. 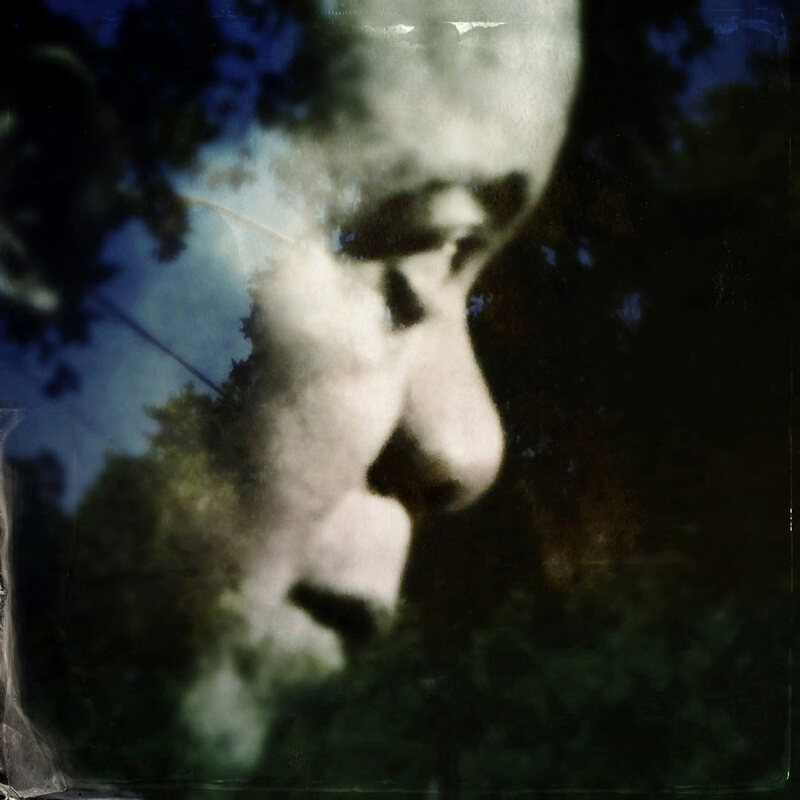 A reflection catches a glimmer of blue sky on an old framed photograph of the late great musician Louis Armstrong, shown during the Satchmo Festival (Armstrong’s nickname) in the Treme neighborhood of New Orleans, La., two weeks before the 10th anniversary of Hurricane Katrina’s destructive winds and floods almost destroyed the city. Slowly and still waiting for help and reconstruction in many areas, New Orleans survives and remains true to its culture and residents as the Big Easy. Planting a quick kiss on his wife’s neck, Burnell Cotlon and his wife Keasha work behind the counter of their Lower Ninth Ward Market. Using their savings, they bought the flood building that was destroyed by Hurricane Katrina. Burnell and Keasha refer to the store as a mini-Costco because it has a little bit of everything. His mother, Lillie Cotlon, works in the concession stand and helps stock shelves. Before the store opened, Keasha would drive elderly residents or unemployed mothers with children miles to the nearest grocery store who otherwise would have had to ride long distances on slow city buses just to buy food. 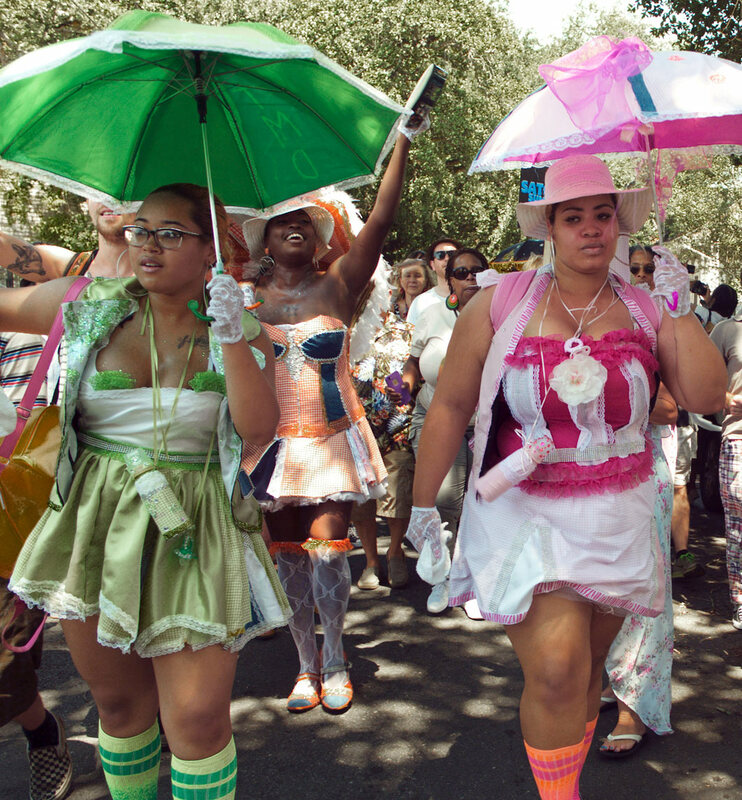 On a bright Sunday morning in New Orleans, just a couple of weeks before the 10th anniversary of Hurricane Katrina’s devastating blow on the Big Easy, members of the Baby Dolls strut their stuff in a Second Line down a boulevard in the Treme neighborhood during the Satchmo Music Festival in August 2015. The city celebrates great musician Louis Armstrong, nicknamed Satchmo, for the donation of millions of dollars to various projects around the city. Second Line parades date back to the 19th century and the African-American social and pleasure clubs that sprang up during the days of the Jim Crow laws that segregated Blacks from white establishments. Hurricane Katrina washed away half the city but the culture in the Big Easy is more than skin deep and remained in tact.